OXFORD, Miss. – Following the Rebels’ 55-20 loss to Mississippi State Saturday night, head coach Hugh Freeze spoke with the media and admitted his team has a lot of work to do. “It’s stinks. It’s disappointing,” Freeze said following Ole Miss’ defeat to Mississippi State (5-7, 3-5 Southeastern Conference). With the win, the Bulldogs snapped a two-game losing streak in the Egg Bowl, marking their first win over the Rebels since 2013. The Bulldogs crushed Ole Miss’ dreams of a third-straight Egg Bowl victory as well as a fifth-consecutive bowl game under Freeze. As the Rebels’ head coach was speaking to the media after the loss on Senior Day, he sounded more dispirited than he did after last week’s 38-17 loss at Vanderbilt. Freeze mentioned many of the mistakes made on the both sides of the football. He pointed out the wide receivers’ dropped passes from freshman quarterback Shea Patterson. He pointed out the team’s inability to stop the run. Mississippi State sophomore quarterback Nick Fitzgerald rushed for 258 yards and two touchdowns, averaging 18.4 yards per carry. Running back Aeris Williams added 191 yards and two scores on the ground for the Bulldogs. Freeze said after the game he told all of the seniors in the locker room that he loves them and he appreciates the hard work they put in to make the Rebels relevant in the SEC. The group of 27 seniors were part of back-to-back wins over Alabama and back-to-back trips to New Year’s Six Bowls (2014 and 2015). With no bowl game on the horizon for this season, Freeze will now turn his attention to finishing up recruiting for his 2017 class and preparing Ole Miss (5-7, 2-6) for spring practices. 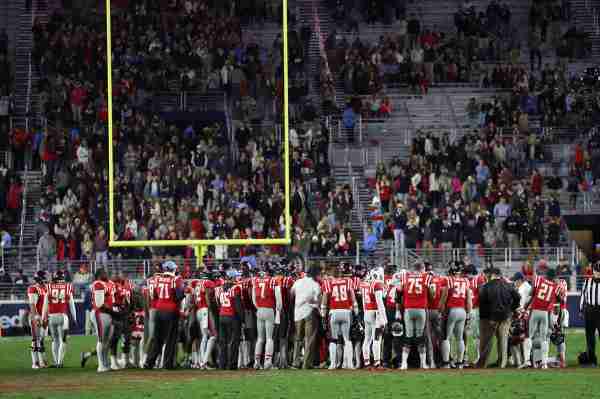 “It’s been a very, very difficult season,” Freeze said. “I know the testament of your faith, it produces endurance and we will find out if you’re genuine in who you say you are and it’s tough at times. It’s a battle; it’s difficult. It’s tough on your families. It’s tough on everybody around the building, so you find out who you are, a lot about everyone that’s with you. The Rebels will lose some key players who have anchored their positions since their arrival in Oxford. Freeze will need to find a successor to defensive linemen D.J. Jones, Fadol Brown, and John Youngblood, to name a few. Marquis Haynes may leave as well, depending on whether or not he chooses to test the NFL Draft waters as an underclassman. Freeze will also have to look to fill the void left behind from the departure of nose tackle Isaac Gross, huskie Tony Conner, cornerback Tony Bridges, tight end Evan Engram, running back Akeem Judd, center Robert Conyers and wide receiver Quincy Adeboyejo. Freeze said he and his staff will look at every position in the off-season. In addition to recruiting, Freeze will now turn his attention to the Rebels’ defensive coordinator position. Ole Miss announced before Saturday’s game that defensive coordinator Dave Wommack would be retiring at the end of the season. Wommack, who coached the nation’s No. 1 scoring defense in 2014, has been the Rebels’ only defensive coordinator in the five years under Freeze.